The Academy for Global Citizenship opened in 2008. Our whole mission is to focus on positive health and nutrition, environmental sustainability and international mindedness. As part of our mission focused on positive health and nutrition, we integrate that concept into our overall philosophy, culture and programs. Given our commitment to environmental sustainability, our organic food pilot program has been part of our school’s structure and approach since our first day of school. We are partnering with Chartwells Thompson Hospitality, which is Chicago Public Schools’ largest foodservice provider, to implement a pilot program in our school where we serve 100% organic and scratch-made food. The program is predominately plant-based. We do serve chicken, turkey and fish. We have Meatless Mondays and source as much locally as possible. Our foods do not contain high fructose corn syrup, trans fats, artificial preservatives, colors or sweeteners. We also developed intentional partnerships and relationships with our local farmers. We incorporate a wide variety of whole grains, fresh fruits and vegetables. We are meeting the HealthierUS School Challenge Gold with Distinction standards. We have an 83% low-income, 90% minority population. Given the challenges in terms of access to positive food in our community, we have created a comprehensive wellness policy to support an aligned food culture. What that means is we have a policy pertaining to foods that are [allowed to be brought into] our building. If a student is interested in bringing food to school a meeting must be held with our principal to ensure that families understand the guidelines, philosophy and policy. Since breakfast and lunch are such an integral part of our school day we really encourage students to participate at school. We have a comprehensive structure to support positive nutrition. For example, we incorporate our organic schoolyard garden and have a really engaged chef who interacts with our students about food. Our teachers model positive nutrition practices. We have parent education workshops, family gardening workshops and composting classes. We have a CSA program where we send organic produce home with our families. We incorporate the school garden produce into learning lessons and homework assignments, so students are taking home asparagus and learning to prepare that with their families as part of their assignments. We have 13,000 square feet of asphalt outside that we’ve turned into a center for urban sustainability. 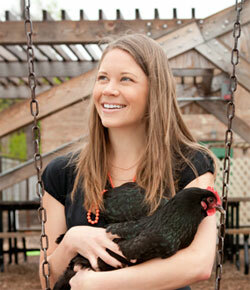 We have schoolyard chickens that lay eggs, solar energy wind turbines, rain barrels and a native species garden. As a result of this comprehensive approach we have the highest participation rates in the city of Chicago. It’s around 99% for both breakfast and lunch. We know that because of the financial constraints the program cannot be taken wholesale and replicated. Our food costs are about 50 cents more per child. We are seeing that [figure] decline as we scale up. But we are taking components and recipes and extending those into the system to impact all of the students in the Chartwells schools in Chicago. My advice for others is to take a comprehensive approach. We don’t believe that simply changing the food that’s being served in the cafeteria is the answer to improving student health. We really need to be looking at a whole holistic answer and how a school’s teaching and learning philosophy and environment is impacting our students’ choices and overall health.